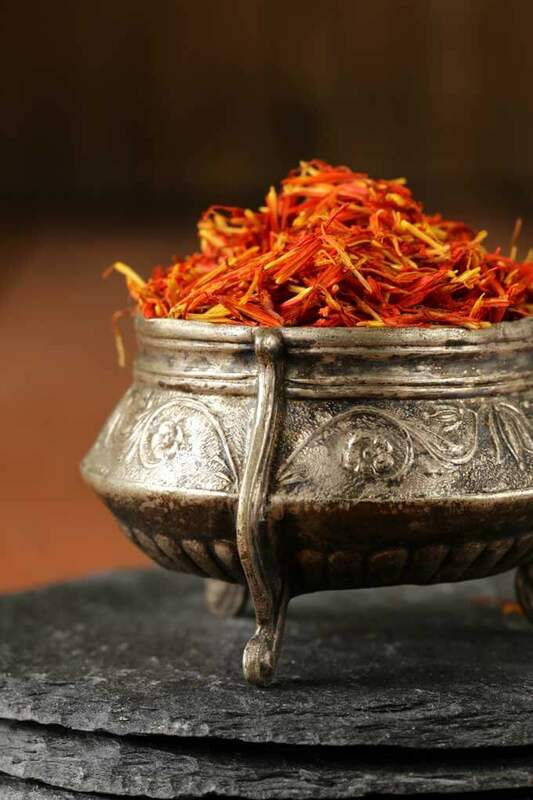 Once limited to royalty, saffron is one of the most expensive natural beauty products in the world. And even at approximately $5,000 per pound for the purest versions, it’s worth every bit! A paste made from saffron, applied on the face and bare arms, was used to impart smoothness and give skin a golden tint in cultures ranging from India to Greece. In fact, saffron’s beauty benefits were thought to be so potent that pregnant women even drank saffron-infused in milk in the hopes that their unborn infants would emerge fair and golden (Blake Lively, are you listening?)! Saffron’s skincare credentials is now validated by science and several beauty companies are jumping on the bandwagon, adding it to their skincare and makeup products. However, if you believe that nothing works better than the real thing, here are some easy beauty recipes to try at home. And thankfully, all you need are 2-3 strands… a 3-gram tin will normally run to around $20 and shall last you for a year. Mix 2-3 strands of saffron with 3 tablespoons of milk. Apply to freshly washed and dried skin and allow it to sit for 20 minutes, then wash off with water. Use once a week for a clear, glowing complexion. Boil freshly grated coconut with a pinch of saffron and a little turmeric powder. The resulting oil makes an excellent hydrator when rubbed into the body. To make a potent beauty scrub that removes all traces of grime and dead cells without irritating your skin, dissolve a couple of saffron strands in warm water and mix it into almond paste (made by rubbing 3 almonds on a marble slab or other stone with a little plain water). Apply this ubtan (natural face pack) to your face and let it dry. Then wet hands with water and rub your face in small circles till all the paste comes off. Suffering from acne? Take a teaspoon of turmeric powder, two strands of saffron and a teaspoon of milk (fresh, unboiled milk works best). Mix everything into a paste and apply on the eruptions. Wash off after an hour. Doing this daily will heal the pimples sans any marks. To make a gorgeously perfumed scrub, soak half a cup of almonds overnight and remove their skins the next morning. Then grind them into a fine paste with half a cup of whole milk. Simmer this paste over very low heat in a thick-bottomed pan till the almonds start releasing their oils. Let the paste cool, then add a couple of saffron threads and mix till well blended. Rub the paste over your body and let it dry. Then shower off – it will leave your body soft and sweet smelling for a long time. To give skin an intrinsic glow, mix a few strands of saffron in pure almond oil and drink a teaspoon every night.